Friday was all about Utes basketball. I was excited to watch them in the Sweet Sixteen but super nervous that they were taking on Duke. It felt like forever until game time and my stomach was doing flips the whole game. Unfortunately, we lost but the team did awesome and I am excited to cheer them on next season. We invited my family over to cheer on the Utes and enjoy some delicious food. Nachos and cheeseburger sliders seemed like the perfect March Madness meal and it turned out great. Everyone loved the sliders! The savory of the meat and sweetness of the Hawaiian bun goes really well together. They will definitely be added to my easy, party foods recipes because they take no time and you can make multiple trays and feed an army. 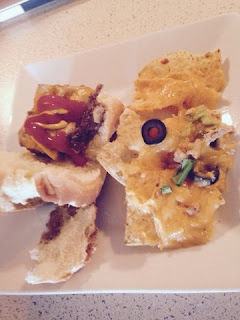 I will share the nacho recipe some other time because this post is all about the sliders. 2. In a large bowl season ground beef with black pepper. Mix in bread crumbs, salt, and onions. I used my hands because it was easier that way. 3. Take a 9x13 pan and press ground beef mixture into it. Make sure you fill the pan and that the meat is in an even layer. 4. Cook for 30 minutes or until meat is cooked all the way. Carefully drain the liquid from the pan. The meat will shrink so that helps with the process. Add cheese over the meat and put back in the oven for another two minutes. 5. Let cool for a few minutes then cut the mixture up into smaller squares. I made fifteen. 6. 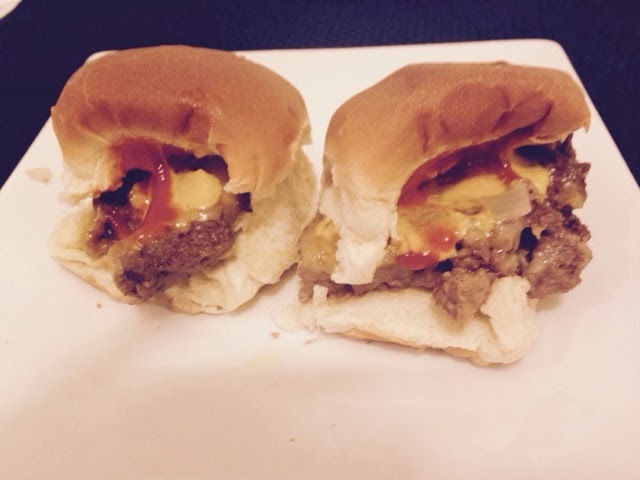 Make slider to your liking. I put out ketchup, pickles, and mustard as options.